Application launchers such as LaunchBar are popular Mac utilities—and more than a few have gained Mac Gems status. Chronos’s F10 Launch Studio is another entry in this crowded field—part application launcher, part Dock and Spotlight replacement, part application switcher, and a bit of a consistent enigma. While the program is powerful and easy to use, it also doesn’t offer much that isn’t already available in the Mac OS. The first time you open F10 Launch Studio, the program installs a new System Preferences pane, then scans your hard drive for all available programs, displaying them in a Launch window. This Launch window is a kind of heads-up display that’s revealed whenever you press a user-configurable keyboard shortcut or move your mouse to one of the program’s “launch spots” (corners of your screen that you specify). When the Launch window opens, you begin typing the name of any application, and F10 Launch Studio will filter the list of applications to display only those that contain the letters you’ve typed. Once you locate the program you want to launch, you can open it with a simple tap of the return key. At the bottom of the Launch window is a dock, similar to the Mac OS X Dock, where you can keep shortcuts to your favorite applications, letting you launch those programs with a single click. F10 Launch Studio supports multiple docks—you can create a different dock for each task that requires a particular set of applications, and switch between those docks using tabs at the bottom of the Launch window. The program also includes a feature called Application Blaster that, instead of opening the entire Launch window, opens a smaller launcher that contains just those applications you keep in your default F10 Launch Studio dock. The beauty of F10 Launch Studio is in its intelligence. 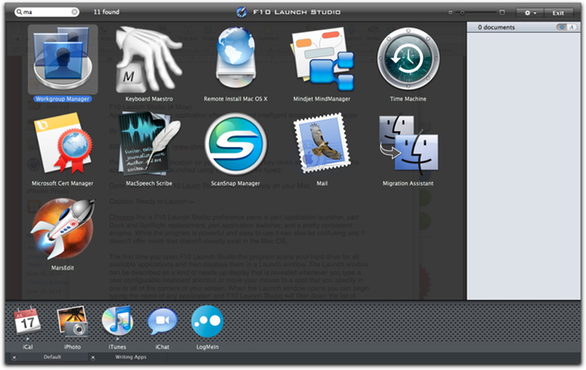 Like LaunchBar, the more you use F10 Launch Studio, the better it gets at determining what you’re looking for. For example, the first time I type VO on my Mac, the utility filters the list of programs to display just VoiceOver Utility and VooDooPad, in that order. If I choose VooDooPad from that list, the next time I open F10 Launch Studio and type VO, VooDooPad appears first in the list. Of course, you can get much of F10 Launch Studio’s functionality via Mac OS X’s Spotlight feature and Dock, but neither of these options is as intelligent as F10 Launch Studio. F10 Launch Studio also offers a number of customization options. For example, you can create your own keyboard shortcuts for launching particular programs. You also get options for limiting which external drives are searched for available applications, and for excluding those apps that you don’t want to appear in the Launch window. And F10 Launch Studio can even display—and let you choose from—a list of recent documents you’ve opened with the selected application. F10 Launch Studio offers you quick, easy, and intelligent access to all the applications on your Mac, making it possible to launch your favorite apps with no more than a few keystrokes. However, functionality similar to some of the features F10 Launch Studio offers are already provided by Mac OS X, so you should give those tools a shot before you plunk down the cash for F10 Launch Studio.